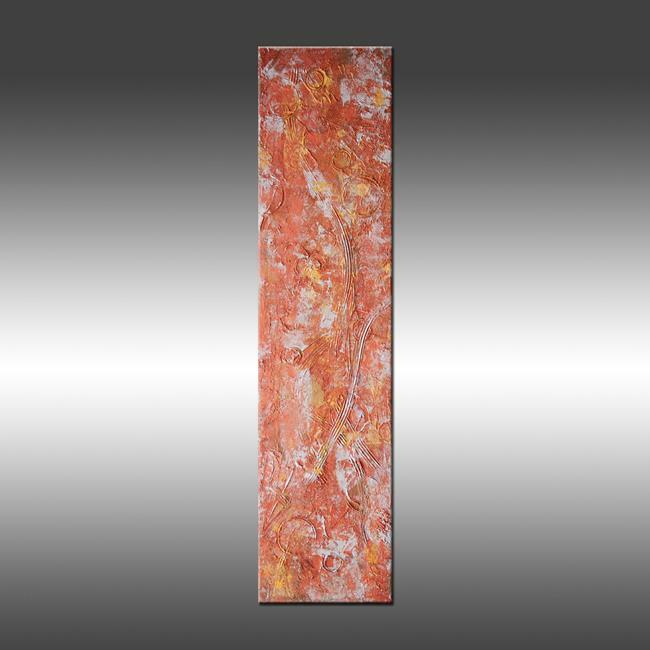 Weathered Metal 6 is an original, modern art painting from the Modern Industrial series. This one-of-a-kind painting was created with acrylic paint on gallery-wrapped canvas. It has a width of 48 inches and a height of 12 inches with a depth of 1 inch (12x48x1). The edges of the canvas have been painted black, creating a finished look so the canvas does not require a frame. This painting can be hung horizontally or vertically. The colors used in the painting are iridescent, metallic gold, silver, bronze and copper. An archival, UV resistant, gloss varnish has been applied to protect the surface of the painting. The painting has been signed by Hilary Winfield on the back of the painting and a certificate of authenticity will be included with the shipment. Each painting is also signed on the front when texture and color allows. If you have a preference about whether it is signed on the front of the painting, please feel free to let me know.